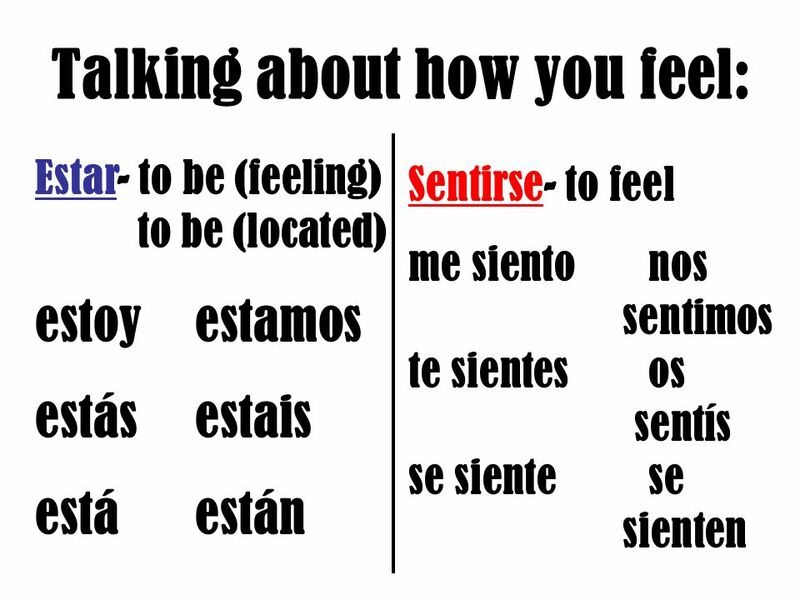 Talking about how you feel: Estar- to be (feeling) to be (located) estoyestamos estásestais estáestán Sentirse- to feel me sientonos sentimos te sientesos. 2 What do the following mean? 1.Me siento cansado. 2. Ellos están enojados. 3. ¿Te sientes bien? 4. ¿Cómo se sienten (Uds.)? I feel tired. They are angry/mad. Do you feel well? How are you (pl) feeling? 3 Write the following in Spanish. 5. We are happy. 6. They are in a bad mood. 7. I feel sick. 8. She feels depressed. Estamos contentos/felices. Están de mal humor. Me siento enferma/o. Se siente deprimida. Descargar ppt "Talking about how you feel: Estar- to be (feeling) to be (located) estoyestamos estásestais estáestán Sentirse- to feel me sientonos sentimos te sientesos." Ir+a+infintive & Acabar de+infinitive. Ir +a+infinitivo Used to talk about what we are going to do in the immediate future Ir=to go VoyVamos VasVais VaVan. ESTAR and SER SER VS. ESTAR You already know the verb SER. It means to be. Cuerpo sano, mente sanaGramática 2 Estar and sentirse Preview Estar Sentirse Master Teacher Grammar Guys Teen Skits. Reflexive verbs What is a reflexive verb? A reflexive verb is an action done to the subject. –Ex. I wash the car. –Ex. I wash myself. –Ex. She talks. El verbo –ESTAR- Sra. Medeles Página 115 en el texto. Aquí se habla Español. Estar Spanish has two verbs that are the equivalent of the English “to be”. One such verb is the irregular verb Estar. Estar is.